Shanti Uganda’s charity event "An evening of Art" is less than 3 weeks away! The funds raised at An evening of Art will contribute to Shanti’s work to reduce infant and maternal mortality in Uganda. This Ambassador really hopes to see you there as its going to be super fun! It’s best to get your tickets sooner rather than later as it usually sells out! Click here for tickets and more info. 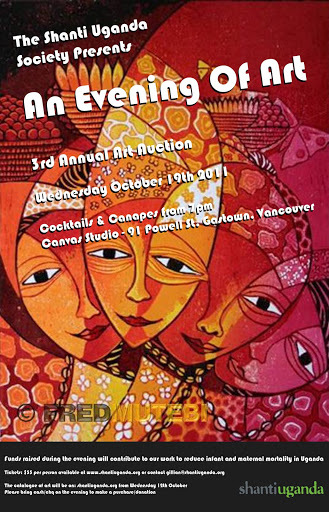 September 28, 2011 in art, Being an Ambassador, culture, fun, goodtimes, helping others, kindness, shanti uganda society, vancouver.